As soon as I opened my box, I was engulfed in this amazing combination of scents coming from a very small box. It was the Greenleaf votive sized starlight candle! The Greenleaf Starlight Candle combines the scents of fruits, citrus, mint and white musk and it is a really strong scent, perfect for the kitchen or a bathroom. 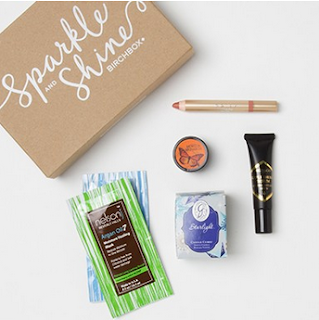 The Birchbox sample is the size of a small votive candle, but it packs the same amount of scent power as a big candle would so it’s definitely a great sample to see in your box! Another great item in my December Birchbox was the Camille Beckman Body Butter in Morelia Monarch. It’s a small container, but it has nice notes of green tea and amber with a base of vanillla. I only wish the sample was a bit larger so I could use it as a travel body butter, but it is far too small for that! Another sample that I got in my December Birchbox was a sample of Skin&Co Roma Truffle Therapy Serum. I haven’t used it long enough to give an adequate review, but I have been using it for a couple of days now and I like it thus far. It hasn’t aggrevated my sensitive skin and it’s a big sample so I’ll be able to see if I notice any difference! I also received two foil samples of Nelson Argan Oils healing mask. I haven’t tried it yet, but I’m pretty excited to as I’m always looking for ways to keep my hair shiny and healthy, which is quite difficult when your hair is so long. There was only one thing in the box that I truly didn’t care for and that was the Mally Beauty Lip Magnifier in Goldenstar. Although it might work for some, the creamy peach sheen just didn’t work for me or my skin tone. I was really hoping I would get to try one of the darker shades, but it was not meant to be. Overall, I was happy with my December Birchbox and can’t wait to see what they showcase in the new year! I think that this is one good collection and perfect choice for the birch box. Good to get the first look at the opening of the birch box. Will be looking forward to use it soon.